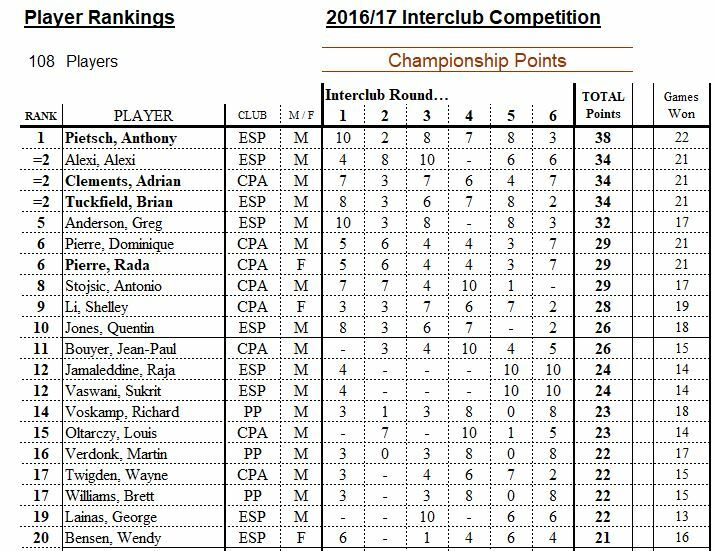 The player ratings have been released for the 2016-17 season. 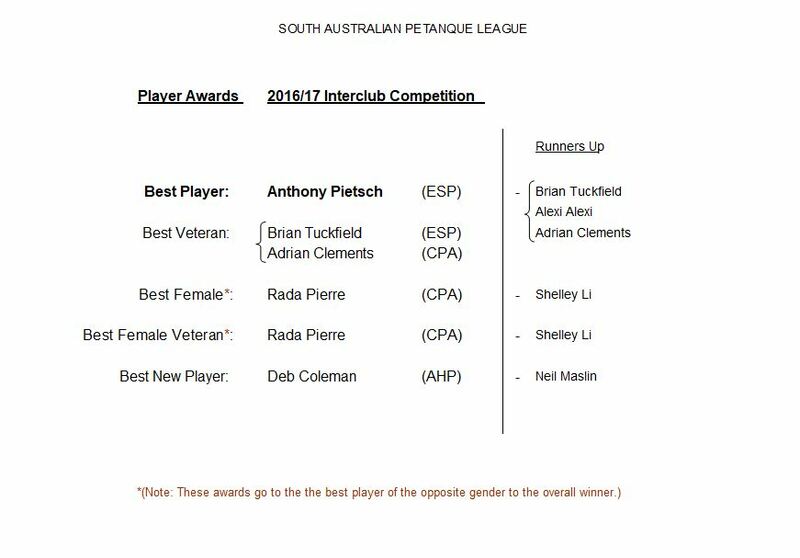 The 2017/18 Interclub season got off to a tempestuous start. Literally. In the face of an ominous weather forecast, 57 brave souls turned up in their wet-weather gear ready to battle it out for their respective club. The fact that there were no late withdrawals or no-shows is, in itself, testament to the dedication and fortitude of this group. Overnight rain had left the playing surface soft but mostly still playable and, fortunately, it cleared in time for the start of play. The cold wind was cutting, but at least we were lucky enough to get through the three preliminary games with minimal precipitation. Then, at lunch time, the storm hit. Some of the braver ones ventured out to start their afternoon games in heavy rain, while the more cautious bided their time indoors. (Bravo to the two NGP teams who actually managed to complete their fourth game.) However, reports began to come in of numerous lightning strikes over the Adelaide area. Therefore, the conditions were deemed to be unsafe and play was called to a halt. As the pistes disappeared one by one under pools of water, and the rain, wind and lightning showed no signs af abating, it soon became obvious that proceedings were finished for the day. It was decided that three out of five games constitutes a quorum, so medals and championship points were awarded, based on the results from the prelims. The early finish left all the footy fans free to get home in time to watch the Showdown (although, after what transpired on that front, some of the Port supporters may have preferred to be out playing pétanque in a storm). Thanks to the Prospect club for hosting under difficult circumstances. …but at least there was no lightning. On that occasion, 18 teams (of the 22 that had registered) soldiered on to the completion of the fourth game. The PFA has it’s first fund-raising effort in association with the Australian Sports Foundation is the HELP GET OUR JUNIORS TO CHINA campaign. They are looking to raise $10,000 to cover the travel costs of their 4 junior players Bronson Romani, Logan Romani, Zac Diep Nicholson and Khrishika Ramjuttun who are representing Australia in the Junior World Championships in Kaihua, Zhejiang Province, China in November. The PFA really needs all your help with this, otherwise the cost of getting these great young players to the championship falls on their parents. The link to the PFA Development Fund is here. Please share the attached flyer and spread the word with your community of friends, business contacts and any other potential sponsors, it doesn’t matter how big or small the donation is, they will all help to get these guys to China.